Butterflies are said to represent transformation and new hope in the future, and they make a perfect theme for a wedding or other significant event. 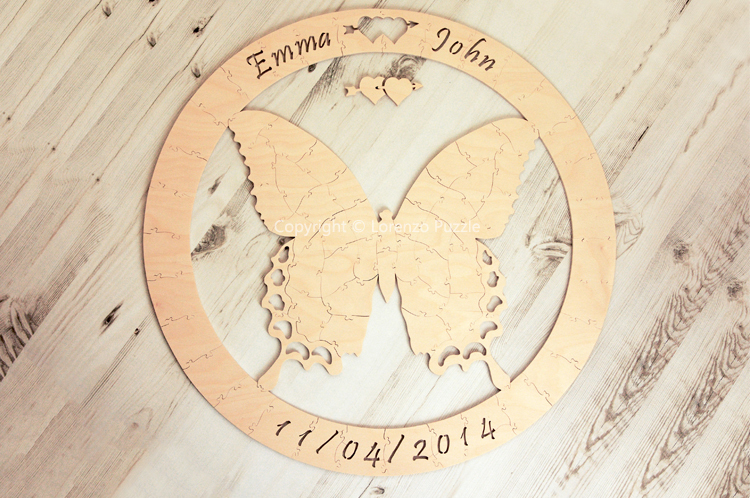 This butterfly guest book puzzle is a special item everyday, but even more so when it features the names of all of your wedding guests or beloved family members. Everyone will love contributing to this finely handcrafted memento. Our birch wood, along with our specialty pens (two included) will make every signature clean and smooth. Unlike traditional jigsaw puzzles, a puzzle guestbooks hand-cut, sanded, and polished of solid wood, allowing special enhancements like cutouts on the butterfly’s wings. 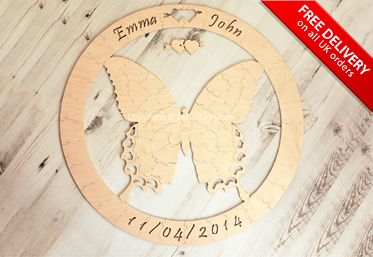 The unique and ornate butterfly silhouette is surrounded by a circular border and personalized carvings such as your name(s), date, a double-heart custom whimsy piece. Assemble the puzzle as much as you like, or frame it forever; it’s made to be treasured and used for decades to come. Others: contact us for quotation. *all of our parcels are shipped with insurance and tracking number. *all of those details are collected right after your purchase and it can be changed at any time till we start production. ¼” Italian Birch Plywood. Grain pattern will vary. Don’t worry, we’ll avoid unsightly knots and blemishes. The puzzle pieces are hand-cut, sanded and polished. As we use only the finest specialty blades to work on your puzzle, pieces always fit snugly together and even smell divine! Most of our puzzle pieces are about 2″ x 2″ in size. We have found this to be the perfect size to write a clear message. *Your jigsaw will be beautifully wrapped before it is shipped. Q: HOW MANY PUZZLE PIECES WILL I NEED? A: Normally less than you think! As a rule we recommend you order between 60% and 80% of your expected guest count. Unless you are giving a piece to every place setting you won’t need a piece per person. If you order too many you may end with too many blanks in your puzzle. In our experience not everyone attending will sign, couples and families often sign as one. On this occassion less is more, as it’s better to have every piece signed rather than leave unsightly blanks. Q. HOW EASY IS IT TO WRITE ON THE PIECES? A: So that you and your guests feel relaxed about not ‘ruining the puzzle’ we willl supply you with some scraps of wood – usually from the same board your puzzle is cut from. You can rest easy and practice your writng. These are perfect for testing your writing materials such as pens and paints. These pieces will be sanded smoothly in the same style as your puzzle so you can have a trial run! A: Absolutely! You have the option of changing your mind about your order right up until the time the puzzle is cut. Hopefully you will have all the information you need before you place your order, if you’re not sure about something, please ask! Q: WHAT IF I DON’T LOVE MY PUZZLE? A: We are proud of our 100% customer satisfaction record and we want you to be completely delighted with your puzzle. Please feel free to speak to us about anything before and during the order process. We are here to answer any questions and to advise you. We will send you proofs of your puzzle if required, extra photos, and do everything to make sure you are totally delighted by the puzzle you receive. Q: YOU DON’T SEEM TO HAVE WHAT I AM LOOKING FOR, CAN YOU HELP ME? A: If you don’t quite see what you are looking for here? Please contact us now. We are very adaptable and creative so we can create you a bespoke puzzle. Please ask for changes to our listed puzzles or let us know your ideas and we will turn them into a reality. Why not ask us for a quote? Contact us now! Q: ARE THEY ONLY FOR WEDDINGS? A: Absolutely not! Puzzle guest books are a unique way to celebrate a range of special occasions such as anniversaries, birthdays, retirement, family reunions, christenings, graduations, baby showers, family reunion, bar mitzvah / bat mitzvah, christening, graduation, etc. etc. Speak to us and we will show you how they can be personalized to suit the occasion. We were looking for a guestbook that was unique and ideal for our small intimate wedding.......such an amazing fantastic piece of art which we will treasure for the rest of our lives.